The other main hope for revenue on mobile devices is advertisements. On computers, years of research have raised significant questions about whether consumers are irritated by or even notice online ads. And there are so many new websites launching all the time that the price that any news producer can charge for ads online keeps dropping. Does the tablet change the calculus? Do ads on tablets, with their higher resolution and more print-like interface, change the way people react to them? There are some encouraging signs in the data for those hoping ads will gain more of a foothold for news on tablets, or even smartphones, than they have on news websites. To begin with, about half of tablet news users, 49%, sometimes or often notice ads when getting news on their tablet (35% hardly ever and 15% never notice ads). This may hold particular promise for customized ads as well as those designed mainly to deliver a message and create brand recognition. Digital ads can also be built around e-commerce, in which users click through to a new domain and ultimately make a purchase of some sort. Here the numbers are smaller, but do seem to be higher than click-through rates on the conventional computer. 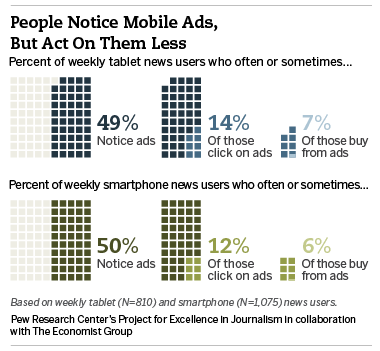 Overall, 49% of tablet news users say they notice ads and 14% sometimes click on them. 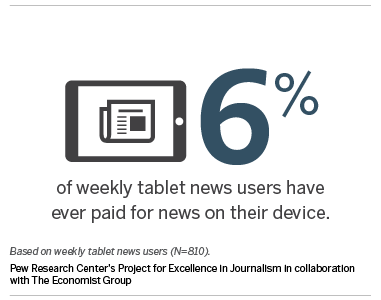 And fewer still, 7% of tablet news users, buy things at least sometimes. That amounts to 2% of all U.S. adults who often or sometimes buy goods or services by clicking through ads they saw while getting news on their tablet. While these numbers may seem small, recent data from Ad Age reports click-through rates for display ads to be less than 1%, meaning that the tablet may be a much more effective advertising delivery platform than conventional computers have been. Despite the difference in screen size, the survey found that the numbers about ads for smartphone news use are strikingly similar: 50% sometimes or often notice ads when getting news there; of those who notice them, 15% at least sometimes click on them and from there 20% at least sometimes buy things. That amounts to 6% of all smartphone news users buying things from ads they notice at least sometimes (about 3% of all adults). Even if they notice ads and even click through them at decent rates, mobile news users are no fonder of them in the mobile realm than elsewhere. When those who get news on all four platforms (tablet, smartphone, laptop/desktop, print) are asked to compare ads across platform, no platform comes out on top. People are somewhat more likely to notice ads on a conventional computer, but overall they say they don’t like ads on any platform. 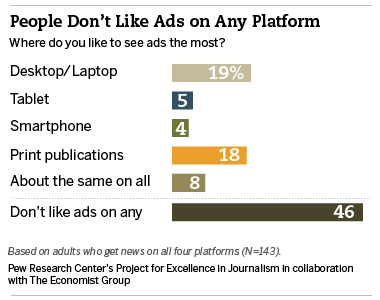 When asked which platform they like ads on the most, nearly half, 46%, said none of them. Still, while people don’t much enjoy seeing ads on their mobile devices – or anywhere for that matter, they are becoming accustomed to shopping through these mobile devices. About a third of tablet owners (36%) shop at least weekly on that device. That is even a slightly greater rate than seen on the smartphone, where a quarter of owners shop at least weekly. This raises the question of whether some other kind of economic equation, beyond advertising, might be part of the formula for monetizing digital news content. The options here are harder to imagine, but they could include sharing consumer information for use in tailoring content, or trying to become better connected to digital retail directly. Another option may be to make the experience feel more like shopping than seeing an ad.